Preheat oven to 200°C/390°F. Line a muffin pan with muffin cups and set aside. In a mixing bowl, cream butter and brown sugar on high speed. Add eggs one at a time and combine well. Fold in melted, lukewarm chocolate. In another mixing bowl, stir together flour, cocoa powder, baking powder, and salt. Add flour mixture to wet ingredients and stir well. Add egg liqueur and stir briefly one more time. Fill each muffin cup halfway with batter and bake in oven at 200°C/390°F for approx. 16 – 18 min. Cool on a wire rack. Place egg white, sugar, and lemon juice in a heatproof bowl and set over a pot of simmering water. Be careful that the bowl does not touch the water. Cook for approx. 5 - 6 min., stirring often, until mixture reaches 71°C/160°F, or until sugar is dissolved. Remove from heat and continue to stir for approx. 5 - 6 min., until mixture is thick and shiny. Transfer frosting to a piping bag. In a small bowl, mix together cream pudding and egg liqueur until smooth. Set aside. 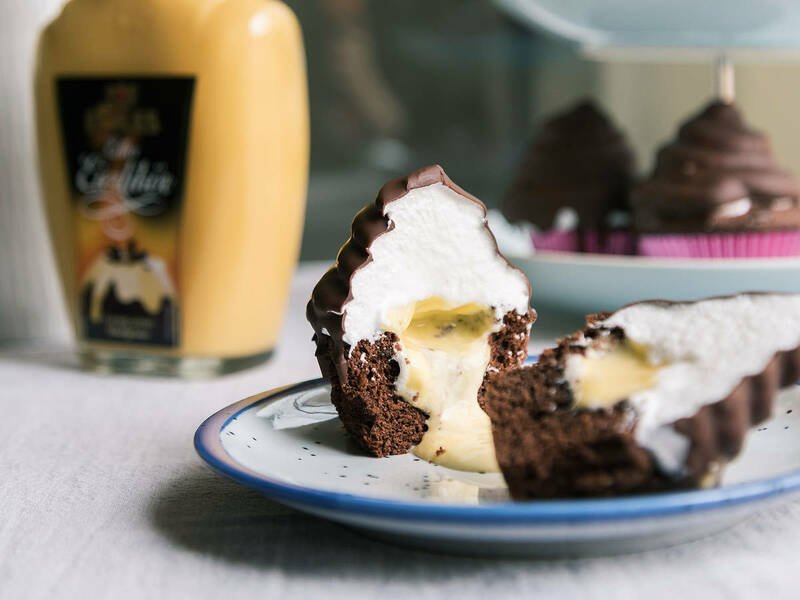 With a knife, cut a small portion out of the center of each cupcake, remove cake, and fill with egg liqueur cream. Pipe marshmallow frosting into a high pyramid on top of each cupcake and refrigerate for approx. 30 min. Stir melted chocolate and vegetable oil together until smooth and let cool down for approx. 5 min. As soon as glaze is lukewarm, dip cupcakes, marshmallow frosting-first, to coat. Let dry before serving. Enjoy!